The German chancellor disappointed British eurosceptics, who wanted her to tell the UK parliament that she wants less Europe. They should be flattered. Her robust endorsement of European political idealism was directly aimed at the threat they pose to the region’s prosperity. 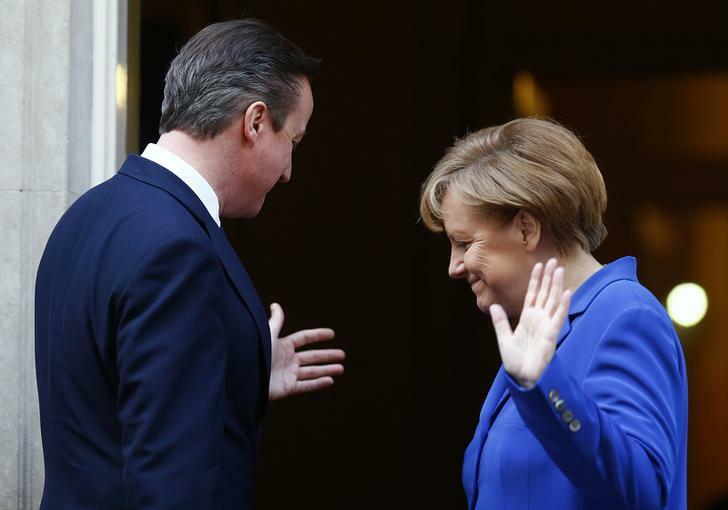 Britain's Prime Minister David Cameron greets Germany's Chancellor Angela Merkel at Number 10 Downing Street in London February 27, 2014. Germany wants a strong United Kingdom with a strong voice inside the European Union to help bring about the reforms needed to strengthen the 28-member bloc, Chancellor Angela Merkel said on Feb. 27 in a speech to both houses of the British parliament. She explained that Britain was an important ally that could help build a strong and competitive European Union.